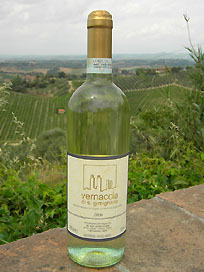 This Vernaccia wine is a close relative of the one tasted in the Middle Ages, whose virtues stimulated the imagination of Dante in his Divine Comedy. The wine is fermented at a controlled temperature and enriched his bouquet from a modest amount of Chardonnay. Due to its organoleptic qualities, approaches the body of red wines. This Chianti wine is produced in our vineyards from tuffaceous soils rich in marine fossils, which tell the story of this land sweet and sunny. 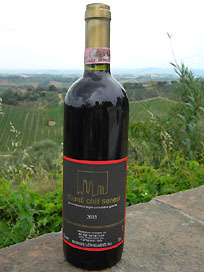 Sangiovese grapes, with modest contributions of Merlot and Syrah, Chianti Colli Senesi give to this perfect balance between body, bouquet and drinkability.